In a meeting today about the upcoming Square-Kilometer Array, I got to learn a little bit about pulsars and cosmology. 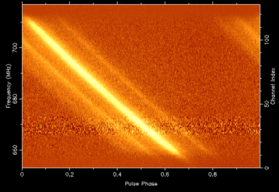 Or at least, about what a radio telescope can do to observe pulsars and the earliest origins of the universe. Even more intriguingly, the SKA will be looking deep into the earliest evidence of the universe’s existence. Light takes time to travel, so the further away a source is, the farther back in time we are seeing it. If we look far enough, we can see back to when clouds of neutral hydrogen (a proton plus an electron) roamed the universe, before stars were created. At that time, we believe that clumps of dark matter formed. These aren’t directly observable, but they attracted the neutral hydrogen (which is observable and opaque). The hydrogen acts as a “tracer” for dark matter. Once stars formed, the radiation they gave off ionized the hydrogen (stripped off the electrons), and it became transparent… so dark matter once again could only be observed indirectly (e.g., through gravitational lensing). Yet due to distance and the limitation of light speed, we can still see back to the time of neutral hydrogen and record the shapes of dark matter then in existence. On a lighter note: The History of the Universe in 200 Words or Less. Next: Leftover Ricotta? Make Gnocchi! I’m glad you enjoyed my History of the Universe!